You are here: Home / Nature News / Nature News / Have you seen a Wild Ginger flower? Have you seen a Wild Ginger flower? Have you ever wondered why some plants brag about their flowers by showcasing them at the top of the plant, while others covertly hide the flower under the leaves? It all comes back to survival and in this case the importance of pollination. Wild Ginger grows along the shady trails in the woodlands at Carpenter Nature Center. During the spring its large leaves spring out the soil, hiding an intricate rusty red flower that sits at the base of the plant on the ground. The flower is bell-shaped and some people say it looks like a jug that has been knocked onto its side. This flower isn’t using UV maps to attract bees. Instead it is trying to attract small flies that emerge from the soil in early spring. These flies are interested in feeding on the thawing carcasses of animals that died during the winter. Although scientists debate whether or not the fly is the primary pollinator, the color of the flower does resemble decomposing animal flesh and the flies are observed entering the flower and getting covered in pollen. During the summer the Wild Ginger’s seed matures. The seed has an elaiosome. An elaiosome is small oily food gift that is attached to the seed, which entices ants to take the seed and elaiosome underground where it will ultimately germinate and form a new plant. Native Americans and early settlers used the plant as a spice but researchers today believe it contains poisonous compounds. 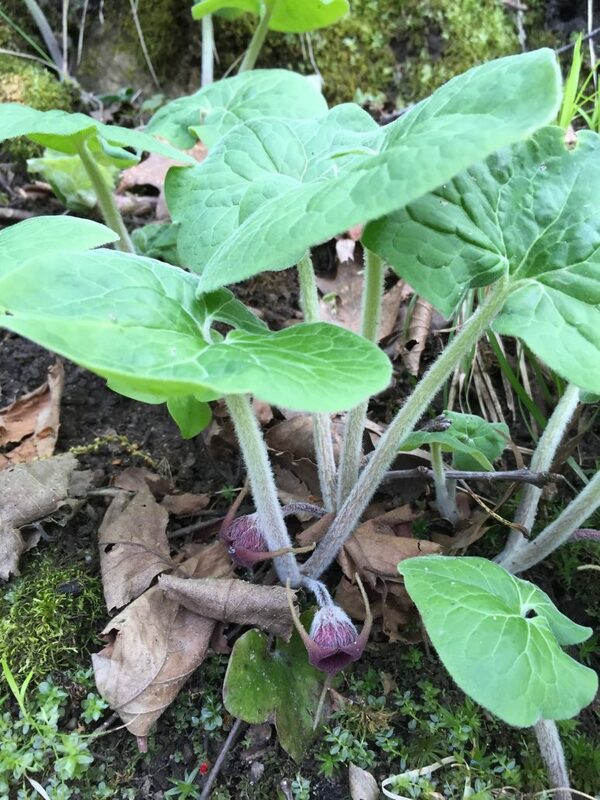 Wild Ginger was also used as a poultice to treat wounds, and modern science has confirmed the presence of two antibiotic compounds in the plant. https://carpenternaturecenter.org/wp-content/uploads/2016/10/Wild-Ginger-by-Jackie-Vierck.jpg 2048 1536 Carpenter Nature Center https://carpenternaturecenter.org/wp-content/uploads/2016/08/carpenter-nature-center-logo.png Carpenter Nature Center2016-10-09 18:13:312016-10-09 18:13:31Have you seen a Wild Ginger flower?